HYATT MOLLY I didn't see you often, but when I did, a huge smile greeted me and you ALWAYS made me laugh. Goodbye beautiful lady. My sorrow and thoughts go to Jackie, Luciano, Vickie, Jessica and Takara. 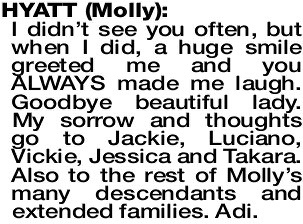 Also to the rest of Molly's many descendants and extended families. Adi. Warm memories of happy times in BBWF days. Sharing and caring for each other. Dear friend of Ann and Kerry.